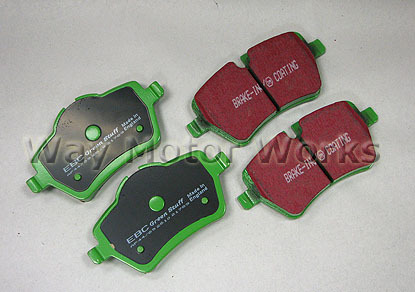 EBC Greenstuff brake pads for 2007-2012 R55 R56 R57 R58 R59 MINI Cooper S, Coupe S, Roadster S, and Clubman S.
These are Great Low dust pads. That are also good for light AutoX or Track use. These pads will only fit Turbocharged Cooper S, Cooper S Clubman, and Cooper S convertible.